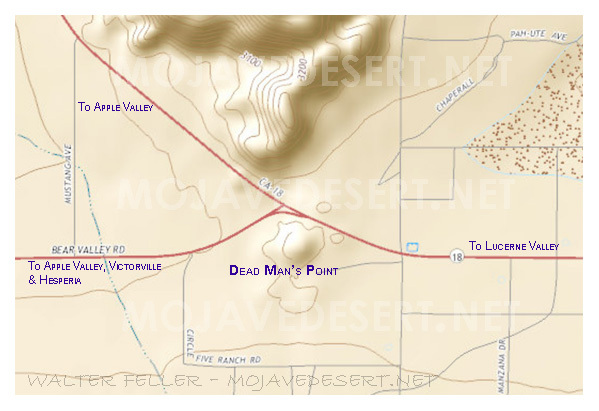 Dead Mans Point is a natural rock formation located at the junction of state highway 18 and Bear Valley road between the high desert communities of Lucerne Valley and Apple Valley about 11 miles southeast of Victorville. How did the point get the name? Story #1: In 1885 W.W. Brown, traveling from Victor to the Box S Ranch, found a man lying dead here. Blankets and the contents of a pack were scattered around him. Story #2: In 1887 Edward Dolch was told that an unidentified man had been found under a large juniper tree on the south side of the point. Story #3: In 1896 James Goulding heard that a miner from Holcomb Valley got drunk and missed his ride back to the mountains, so he started walking. Instead of carrying water, he carried a bottle of whiskey, which he had emptied by the time he reached the point. 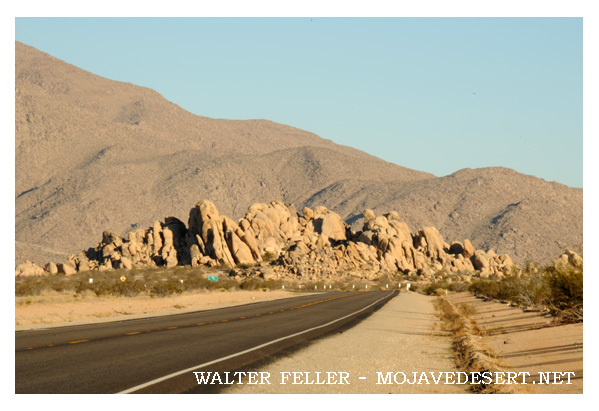 A teamster found him lying dead in the shadow of a big rock. Story #4: From certain angles Dead Mans Point looks like a dead man lying on his back with his arms folded over his chest.